SoundFlow is going to save you hundreds of hours over the next few years. How do you wanna spend that time? Tired of all that mouse clicking and trying to remember a gazillion shortcuts in your head? Take a real shortcut instead! 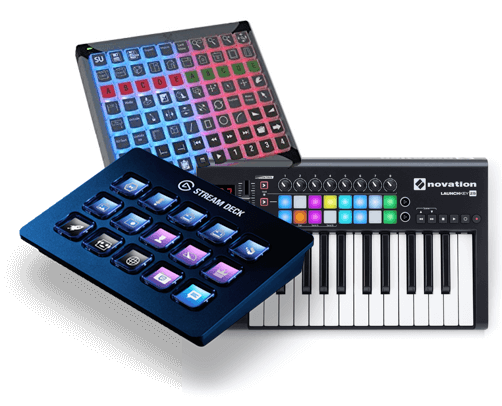 SoundFlow supports triggering commands from custom devices such as Elgato and Xkeys, as well as any MIDI device. Program the devices with your own custom icons so you won't have to remember anything. Let's make sound editing fun again! Take advantage of hundreds of custom scripts created by our community experts, or get help to write your own. With SoundFlow you can develop an entire suite of automated commands, and tailor them to meet your organization's workflows. Or you can borrow from our growing library built by your colleagues around the world. Tasks that used to require tens of man-hours can now be done in a matter of minutes. Save yourself time to be more creative, or to get home an hour earlier - it's up to you. Why do you need to click 10 times with a mouse on small colored circles and buttons to do a simple task? We believe if we make some of today's click-heavy tasks easier, they stop being something we do some of the time, and become something we just do, all of the time. Let the computers do what they're best at - repetitive, logical lists of tasks - and let the humans do what we're best at - being creative, emotional and making original decisions. SoundFlow is an always improving workflow platform. We build new features all the time and release new stable versions every month. We work closely in tandem with industry leaders from around the world, and what's even better - we use it ourselves. SoundFlow is built by a dedicated team of developers & sound designers, who want to make life easier for each other, and for you. SoundFlow is built for sound designers & composers - by sound designers and composers. Why don't you join us? We are only as good as our community makes us. Great ideas for new workflows benefits everybody. If you have an idea, a little script that saved you time, a feature request, a question, or maybe the next revolutionizing workflow - please share it in our forums. Ready to get started?Get in touch or create an account.